Microsoft has begun testing Your Phone - a Windows 10 app that lets you interact with your Android handset without taking it out of your pocket. The app is now available to members of the Windows Insider Program who've chosen to make themselves Microsoft's guinea pigs by joining the Fast Ring. Third-party apps like Pushbullet already offer similar tools for managing files on mobile devices from your desktop, but this is the first time we've seen them integrated directly into Windows. Microsoft gave us a preview of Your Phone at its annual Build Conference in May. General manager Shilpa Ranganathan demonstrated the app by dragging and dropping files between a handset and a Windows 10 device, typing text messages from the comfort of a full-size keyboard, and accessing Android notifications on a big screen. 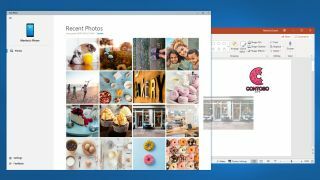 Microsoft's release announcement explains that Your Phone is also particularly handy for photographers, presenting you with a roll of recent photos from your mobile device, which you can drag straight into your favorite desktop photo editor. It's much more convenient than emailing files to yourself, or even syncing them to a cloud storage service. Microsoft says Your Phone will roll out to all Windows 10 users "soon", but we're expecting it to arrive with the Redstone 5 update around October.